and his other, slightly lifted, leg salvation. This six-season year of humans is said to be but one day for the immortals. A day has six periods: dawn, morning, noon, afternoon, evening, and night. These are when the six daily pujas in temples are performed. 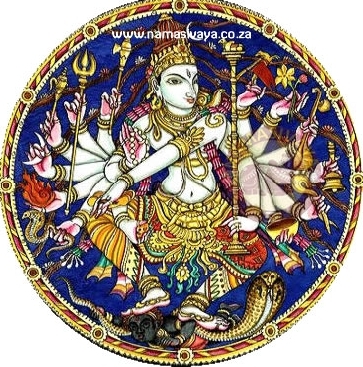 During each of these six parts, an abhishekam has been ordained for Lord Nataraja. One of these is Ani Thirumanjanam, the pradosha abhishekam on the evening of the day of Uthiram star in the month Ani (June-July). This is the best time for worshipping Lord Siva. It is popularly believed that it was on Aani Uthiram day that Lord Siva appeared before Sage Manikkavachakar under a Kurundai Tree and offered upadesha (advice) and during the abhishekam to the Lord, as everyone watched, the sage merged in the Lord as a brilliant flame. Sage Manikkavachakar is the author of Thiruvachakam.